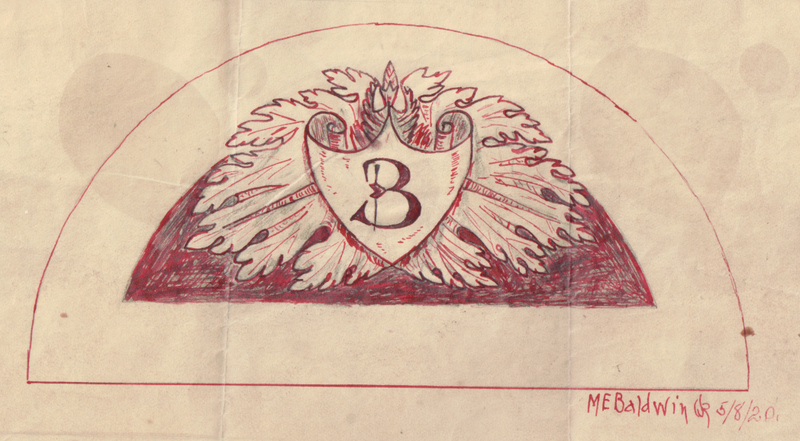 Recently, we discovered two additional letters written by my grandfather, Miles E. Baldwin, during his service in the Ambulance Corp in France, 1917-1919. I am adding these to the previous post series on this subject. The first letter was written during the period when Miles was recovering from illness, and enduring a long convalescence. He was exposed to mustard gas and also suffered hearing loss from artillery blasts; the mustard gas caused some serious respiratory problems. He was unhappy being away from his company and the men he had trained with, and was trying to be reassigned to his unit. Sir: – I greatly desire to return to your command and since it is only through your insistence that my return is possible, I appeal to you again. It has been my misfortune to be separated from the company by sickness; now that I am well I desire to be back with my comrades, with the company that I esteem above all others. Application to the Div. Surgeon and Headquarters of the 41st Div, also applications sent to the 161st Field Hospital have returned some men to their original companies. I am now in good health and feel great confidence in my ability to carry out everything in line of duty. Please give me a chance to play the game like a man, and not remain here like an unfit, entirely out of it all. I have done everything possible to effect my return, but it’s only through your effort that it can be brought about. Will you please notify me if you desire my return to your command so that I may act in conjunction with your wishes. Pvt. 1/cl Miles E. Baldwin, Jr. The letter has a typed heading along one side: HQ1 26th DIV. AEF. 705. (Dis. from Hosp.) May 9, 1918. The last letter was written about a year later, to Aunt Jennie, and contains some more details of his stay. He never was returned to his unit, and endured a variety of random assignments in the year before his departure back to the states. Dear Aunt Jennie, I am in Brest, on the sailing list and expect soon to be on the way back to the States. I feel pretty fair considering the manner in which I spent my time convalescing. During that time I did everything from administering an anesthetic to digging drainage ditches. Do not send any more mail to France for I will probably be on my way home before it arrives here, besides I haven’t received any mail since January 12, anyway. The rain here is continuous and after you take a breath of the air here, you need a bellows to blow the fog off your chest. I suppose most of the boys in my old unit are home or in the States by the time you receive this letter. I expect that it will be rather rough crossing at this time of the year. I send love and best wishes to you all and I hope the days will be few before I am back in little Rhody again where the sun shines once in a while and New England boiled dinners are obtainable. Combined with the earlier letters and pictures these letters give me a better idea of his two-year experience. Miles Edward Baldwin returned to Providence after his discharge in April, 1919 just in time for the Roaring 20’s. His Army training and injury in France while serving as an ambulance driver were, seemingly, behind him, although the injury would affect his hearing for the rest of his life. Of the few things that Miles brought back from the war, the one that I think expresses the horror of it best is a postcard from France which he labelled, probably years later. I find it hard to look at this postcard of all those new graves, and his caption seems very poignant to me. I know he was looking forward to returning to Providence and starting work. At some point, his uncle who was a trustee of the Narragansett Electric Company used his influence to get Miles a job there. He did different jobs for them over the years, two of which were appliance salesman and coal quality tester. In the 1920’s, Miles married. But it wasn’t my grandmother, it was a first wife who I can only identify as “Mary C.” from the 1925 Rhode Island Census. My memory of this marriage goes back to my childhood when I was within earshot of Grampa’s rendition of the story of his divorce. This was spoken of so seldom that I have remembered it all these years. Grampa knew that Mary was cheating on him, but divorce in those days was difficult and required actual evidence of infidelity. He managed to know the location of a tryst his wife was planning — whether it was his own apartment or a hotel, I’m not sure. He hired a photographer and they burst into the room, snapping photos. The man jumped up from the bed yelling “I’m sorry! I’m so sorry!”. Grampa replied: “Buddy, you’re the best friend I ever had.” And so ended that marriage. Miles enjoyed his Yankee Division, Veterans of Foreign Wars activities in the years that followed. During WW2, he served as an air raid warden. Taps was played at his funeral. I’d like to think that he never forgot those that couldn’t be saved on the battlefields of France. I hope that we don’t either. A few remaining letters are covered in part 4. 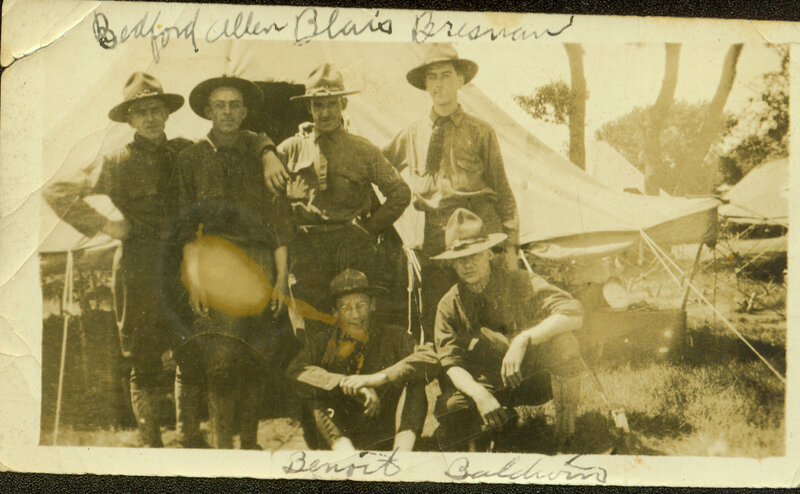 When we left off in part 1, Miles Edward Baldwin was stationed in the Argonne, France, serving as an ambulance driver in U.S. Army. At some point Miles was exposed to a nearby bomb blast and mustard gas. Later in life, he developed hearing problems, but at the time, he suffered from prolonged chest and lung problems which landed him in a military hospital. We have several letters he wrote during that time. I’d like to include those here. I suspect there were many more letters, but these are what we have. From the Part 1 blog entry we learned that Miles’ mother died when he was tiny, his grandmother died in 1907, but he was close to an elderly aunt and uncle, Aunt Jennie (there is a post about her) and Uncle Will. The first letter describes the Christmas, 1918 festivities at the hospital. Name: Private M.E. Baldwin Jr.
Dear Aunt Jennie, I’m wishing you and Uncle Will a Merry Christmas to-day in my thoughts. I hope you will pardon the pencil for I am “sans encre” at present. Yesterday evening I received all my September mail and the photo of you & Uncle Will & Jennie May. It is a dandy and it came just in time for Christmas. I also received the letter from the Cape and it was bully to hear from everyone. I certainly do remember West Harwich and the dandy trip we had in the summer of 1917. The letters I received were of the following dates Aug 30, Sept. 2, Sept. 10, Sept. 12, Sept. 16, Sept. 22, Sept. 27 and Sept. 20 and the photo. All this mail was delayed with my company in the Argonne sector where there was bound to be more or less confusion. [back] We had a corking good dinner here to-day, the best I ever had in the army. We had turkey, mashed potatoes, creamed corn, grape jelly, brown gravy, bread and BUTTER, coffee, raisin pie, pumpkin pie, cake, figs, oranges, grapes & apples, and to top it off a real, honest to goodness cigar. There was plenty for all, more than we could eat and believe me, us boys did it justice. I feel pretty fair now, not withstanding the dinner. Was examined again yesterday & my lungs & bronchii are O.K. Heart is quite rapid but there is no leakage and it is a good deal better than it was a week ago, so I will come out of the war but a little worse for wear. I expect to be either on the way to the Rhine or to the States very soon. I will write often and keep you posted. I send my best regards to Dr. Davenport and was very glad to have him write. Tell Uncle Will I hope to reach the Rhine and see a little of Germany. I send lots of love to you all and thank you for the photo very much. “John Hopper”. Pvt Miles E Baldwin, Jr. I guess “John Hopper” is either a private joke or a WW1 expression. I don’t know. Dear Aunt Jennie, I am going to be here for a few more days, probably two weeks, until my heart is O.K. Then I will probably start on the next steps towards the states. I am feeling O.K. now but am a little nervous, the effects of gas are very slow to disappear, but I’m getting along fine. At present time I am doing light duty in an ear, eye, nose & throat clinic. The work is interesting and I am glad to be able to help out a little. It will probably be quite a long while before we all get home for there are so many of us and we have to avoid congestion of transportation and it is hard to find quarters for us all near the seacoast, besides, the weather is fine rain, rain, rain and the mud is awful, half way to ones knees on many much traveled roads. We are happy for we know that we will get home for certain, it is only a matter of time and a few weeks don’t matter after a year and a half of it on the line and of course now the uncertainty of our ever getting back is removed. Lots of love to Judge and yourself, I will write again when I move on from here. Ted. Dear Aunt Jennie, I have looked over the situation here and have been examined by two medical boards. My lungs are O.K. and bronchitis improving. I will not be operated on for hemorrhoids or sinusitis and will be discharged in about 5 days and ready to go to work as soon as I arrive in Providence. I shall still hold my insurance for $10,000 and if I can will change it for an endowment policy. I certainly will be glad to leave here, about the only way to get compensation in the war was to lose a leg or some other part of one’s anatomy essential to earning a livelihood. I will be a “civi” toot sweet. Lots of love to you and Uncle Will. n.b. Blanchard was here to see me Sunday. He is well. 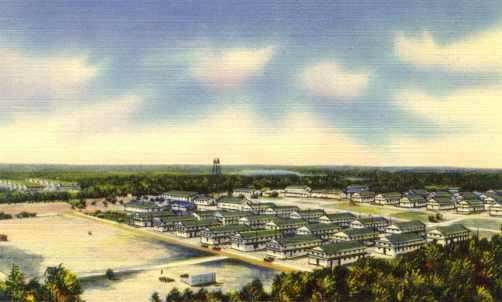 “Camp Upton” was a military camp on Long Island that, after WW2, was turned into Brookhaven National Laboratory. “Blanchard” was his brother, who was serving in the Navy. In Part 3, Ted returns to Providence. 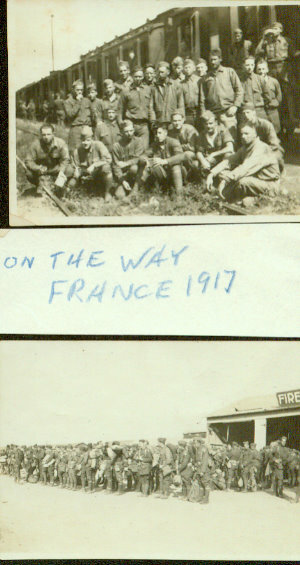 My mother would tell you that her father never talked much about his experiences during World War I driving an ambulance on the battlefields of France. Talking choked him up and was just too difficult, although he did enjoy old songs from that era – “My Buddy”, “There’s a Long, Long Trail” and “Over There”. But late in life, when maybe only the grandchildren were around, he did seem fond of talking about it. I wish I could have those conversations back, to learn more about why he joined the medical unit instead of a regular Army unit, and to find out what troubled him so much that he didn’t talk about it for decades. He mostly amused us with stories of learning a foreign language (“they don’t call it a hospital, it’s an oh-pee-tal”) and some grim references to the ever-present gangrene and mud. I don’t ever recall him saying that his hearing was damaged by exposure to a bomb blast, and his health was compromised by mustard gas. But it was something we all knew. Miles Edward “Ted” Baldwin Jr. was born in April, 1893. His mother died when he was 4 and he and his younger brother were not especially welcome in the home of their quickly-remarried father. Grampa had a childless aunt and uncle that were fond of him and stayed close to him. Perhaps it was the Civil War anecdotes of that uncle that made Grampa think that enlisting would be a good idea. Was it his interest in science that steered him toward the medical unit? Or was it a desire not to harm anyone? Unfortunately Grampa’s military records were destroyed in the 1973 fire at the National Personnel Records Center in St. Louis. 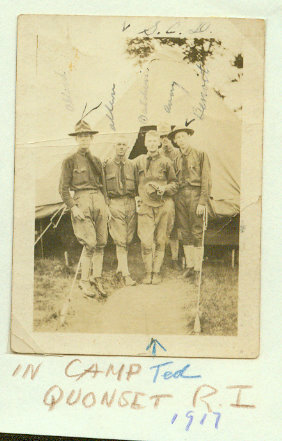 So I am reconstructing the story from his discharge papers, photos, drawings and letters. 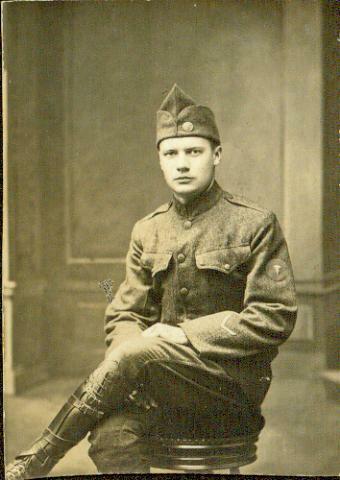 Ted enlisted in the Army on April 10, 1917 in Providence, Rhode Island. He trained in Camp Quonset, Rhode Island. U.S. Army, 26 Reg, 5th Div., First Rhode Island Ambulance. And notice – they are actually staying in tents. According to something scrawled on the back of the photo, I believe they called themselves the “Rhode Island Ruff Necks”. I’m sorry, Grampa, if 95 years later, that just seems adorable. It was still 1917 when they boarded a train, then a ship, for France. In France, Ted served in the Medical Department, Field Hospital 161, U.S. Army at Meuse-Argonne, Oise Aisne, Lorraine and Champaigne. The few mementos from France are not as cheerful – a metal match box with German words “Gott Mit Uns”, a metal cigarette box, a souvenir scarf, a red cross armband. His job was to bring the wounded off the battlefields and into the field hospitals. I’m sure, many times, he wished he were back in the rural camp environment of Quonset. Ted, like his whole family, was a bit of an artist. 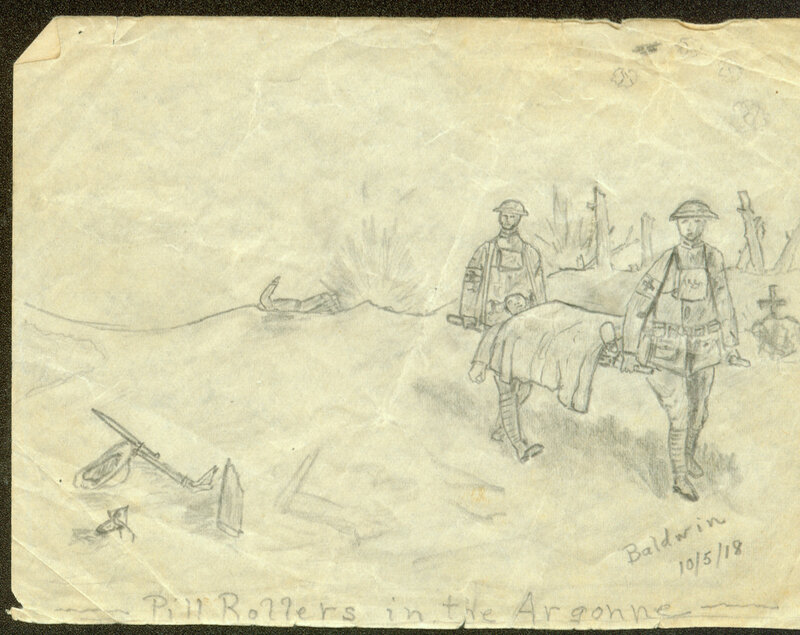 The drawing from 1918 is entitled “Pill Rollers in the Argonne”. In Part 2, some sad souvenirs from France and three letters home, including one from the hospital. In Part 3, Ted returns home.